2 bathrooms fully furnished apartment in Princess Park, Calahonda, Mijas Costa, Andalucia, Malaga, Costa del Sol. Calahonda is a coastal holiday town situated between Fuengirola and Marbella, just 30 mins by car from Malaga Airport to the West on the N340/A7 road and 10 mins from Marbella or Fuengirola where there are plenty of beaches, shops, bars and restaurants catering for every taste. There are many facilities and attractions within the local area which appeal to both adults and children; beaches and water sports, adventure parks and family centres, as well as golf and sports centres. There is also a wide selection of local bars and restaurants offering styles of cuisine from different parts of the world. For a dream family holiday there are Aqua Park and Zoo. Situated in a quiet location away from the main shops and bars, however there is an excellent choice of restaurants and bars together with 2 mini-supermarkets within few mins walk. All rooms are with fitted wardrobes. Twin single beds in other rooms apart from the Master bedroom that has a double bed. There is lift access and car park. El Mirador overlooks La Siesta Golf, a 9 hole course with driving range. Miraflores Golf, Mijas Golf and La Cala Golf are also within a short drive or bus ride from Calahonda. Visit the the beautiful harbour and beach area of Puerto Cabopino. Estepona and Marbella are also close by. Further out, Gibraltar is approximately 80km to the west,a favourite place for many visitors from the UK. Many of the inland towns and villages, often called ‘white villages’ such as Ronda and Mijas have character that reflect a diverse influence. Alhaurin, Coin and Pizzara are also worth seeing. On Wednesdays and Fridays there is a local market at the next door Urbanisation, Calypso. Also there is a major market at Fuengirola on Tuesdays. Puerto Banus market is at the bull ring, on a Saturday. All markets are open in the mornings until approx 2pm. Aqua Land – Torremolinos – the biggest water-park in Europe. Huge choice of attractions for all ages.. Giant water slides, Wild River and the Kamikaze to name a few. Young kids get their own separate area. Tivoli World – Benalmadena. The biggest Theme Park on the Costa Del Sol. This is a must for all. Open from early evening till midnight. Lots of fun for all ages. Telecabina Cablecar – Benalmadena. Ride on this Cable Car starting near Tivoli World and taking you right up to the scenic mountains of Benalmadena. Ride approx 20 minutes. 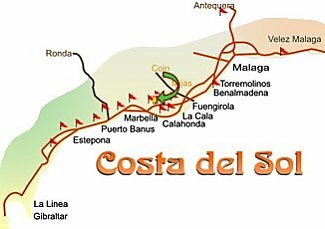 Selwo Safari – Estepona. Selwo brings the African wilderness to Spain. From elephants to tigers, Lions to Buffaloes. Selwo is an experience for everyone. Selwo Marina – Benalmadena. This gorgeous park spreads out on two hectares and forms part of the municipality of Benalmádena. The visitor is guided to the marine.